In our busy, always-in-a-rush society, I have found meditation to be especially calming and beneficial to parents and children alike. You may think your child is too young or incapable of meditation, but even children as young as age three are able to sit next to you and mimic your meditation, eventually settling into their own true meditation practice. Finding more family time is a hot topic these days, and spending it meditating together is a great way to bring more mindfulness to your lives and focus to your days. 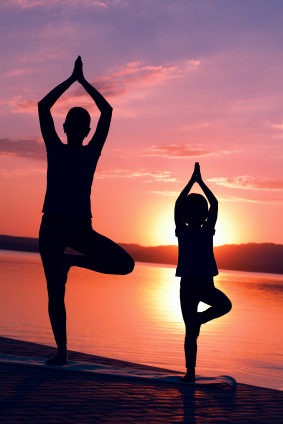 Here are some tips to help you get started on meditating together as a family. 1. Show your children what meditation looks like. If you have toddlers or very young children, they may have no idea what mommy or daddy is doing, so before having them join you, consider spending a week letting them be present while you meditate. Children are social learners, and model that they see. They may play around you or they may decide to sit next to you and try it out for themselves. The goal is to show them what it looks like to be in a meditative state, and to show them how it is an important part of your daily life. 2. Establish a routine. Set aside a specific time each day to meditate. Morning is a wonderful time for meditation, as it helps calm the body and focus the mind to prepare you for the day ahead. However, if you find your family’s morning schedule to be full of conflict during morning hours, consider meditating at night before dinner or an hour before bedtime. 3. Create a meditation center in your home. It doesn’t have to be a large part of your home, but your meditation center should at least be large enough to accommodate each family member meditating in the same space. This space should be void of interruptive vehicles as much as possible, such as televisions and telephones. 4. Play Baroque music in the background. Children, especially, may have difficulty sitting still and focusing in silence. Baroque music syncs up with the natural rhythm of the human heart, and is known to calm anxiety and help you focus. 5. Allow each family member to embrace meditation on their individual terms. We all have our own rhythms, but children may need to be eased into meditation: consider starting them with 5-minute meditations, then moving into 10-minute meditations, and so on, until they are able to meditate for 20 minutes at a time. Teach them that when distractions occur – such as the dog barking or the phone ringing — they shouldn’t fight those distractions but rather invite them into their meditation. By embracing distractions into their meditation, they may then be able to sit or lay down for longer periods of time. 6. Expect some bumps in the road and don’t give up. Children, especially toddlers and younger children, may be restless after just a few minutes. They may decide not to join you at all after a week of watching you meditate. Or they may try it for a day, and then have a terrible time the next day and declare that they never want to meditate again. As a parent, keep moving forward with your own practice, stick with your routine, and continue to have your children see you in the meditation center of your home. Eventually they may decide to join you again, and when they do, you will be ready to begin a meditation practice as a family.